The difference between an average stucco job and a superior one is in the details. From start to finish, Think Stucco performs the tasks critical to the art of stucco craftsmanship with skill and a commitment to excellence. Below you’ll find an outline of the steps we take to create the finest quality stucco project. Lath acts as a weather barrier for your home, so it’s the most critical phase of the project. First, we install Weep Screed, a product that allows moisture to drain from the stucco system. Next, we apply two layers of Grade D tar paper moisture barrier. Finally, we secure a 3.4 galvanized self-furring metal lath to the surface. This essential combination of processes often requires a city inspection. Browning protects the tar-paper moisture barrier and adds a base for the finish coat. Our craftsmen combine Portland and mason cement, common sand, water, and acrylic add-mix to create browning, which we expertly apply by hand in a ¾ inch layer. This cures a minimum of seven days before we apply a Portland Traditional finish coat, or up to 28 days if you’ve chosen a Synthetic Acrylic product for your finish. The last and final step to a beautiful Think Stucco installation is the decorative texture and color phase. (This is the fun part!) There are two types of finish coats: conventional and synthetic. Each has different benefits. Conventional stucco has the “old world look,” is more breathable, and can be applied over rough surfaces. Synthetic finishes offer a greater variety of color choices and smoother finishes. 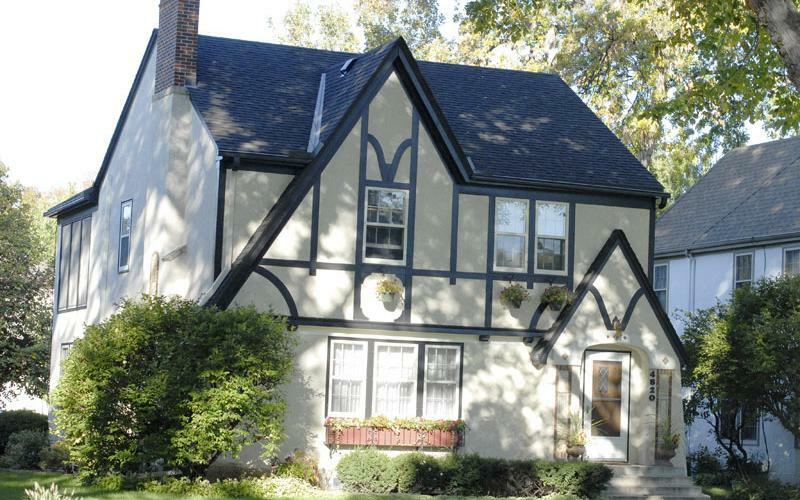 For the average Minneapolis home, the finish coat phase takes 1-3 days.